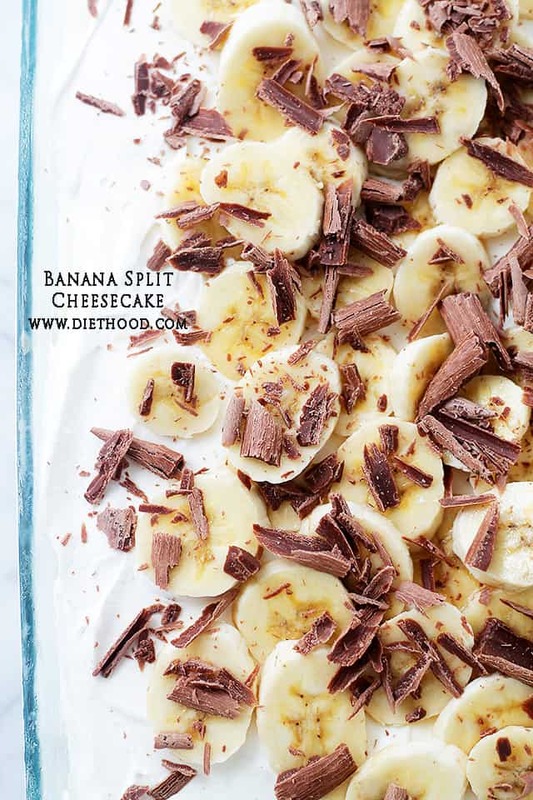 Banana Split No Bake Cheesecake – Graham Cracker Crust topped with a creamy cheesecake mixture, vanilla pudding, pineapples, bananas and whipped cream. …Also known as the Cheesecake that feeds an army. Or a crowd of 20-some. Hi, GUYS! Happy Monday! Happy 1st day of September! Happy Labor DAY! WOW! We have SO much to celebrate!! I’m stickin’ it to the 1st of September by posting the most Summery dessert, ever. In my defense, I had every intention to post this recipe waaaaaay before Labor Day so that you would have a chance to make it FOR Labor Day, but… I didn’t. It completely slipped my mind… too many White Sangria drinks… just kidding! Maybe? Are you chillaxin’ today? I am! My plan is to wind down on the couch for several hours, or until Goce gets home from work. Working on Labor Day… isn’t Labor Day about NOT going to work?? Something’s not right. Or is it? I mean, Labor Day is kind of an oxymoron because we are essentially celebrating “work” by taking the day OFF from work! Ever think about that? Obviously, I do. Anywho, after he gets home, I’m going to continue to relax because THE grill is his. Also, remember that one time in college when you were asked to bring a huge banana split anything dessert to the huge-est block party?? And then, after everyone ate the whole darn thing, you were pissed off because you didn’t get a chance to try it?! GAH! Since then, I have changed the recipe a bit, with most components made from-scratch, but it’s still just as delicious as the original, if not better. Better-for-you, that’s for sure! I even make my own vanilla pudding at times, but only when I am making a smaller batch for a crowd at home. If I plan to take this cheesecake to a potluck type party, I whip out the instant stuff because it’s A LOT quicker. Homemade pudding needs to chill a couple of hours before you can use it. THEN, the whole cake needs to chill another 4 to 5 hours before you can cut it… so that’s that. 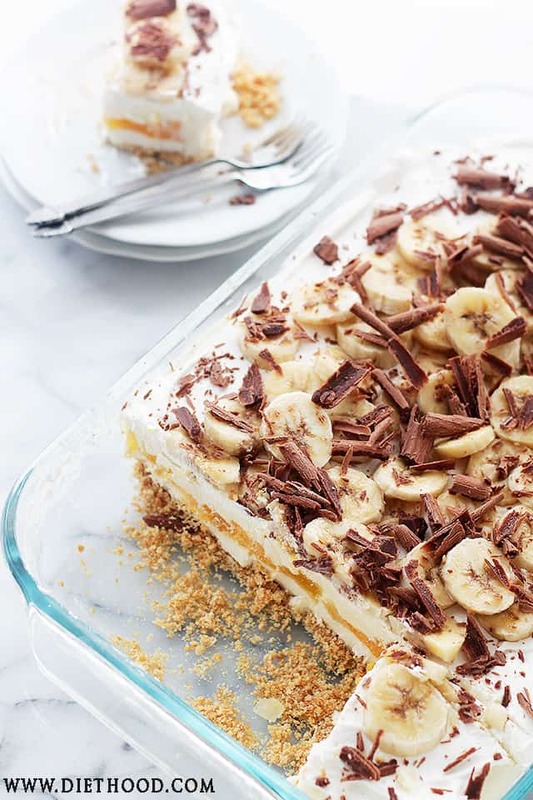 If you have some time on your hands, like, starting right now, make this Banana Split NO BAKE Cheesecake – you’ll have an awesome dessert to bring to the grillin’ party later today! 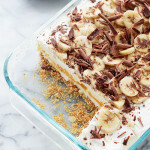 Graham Cracker Crust topped with a creamy cheesecake mixture, vanilla pudding, pineapples, bananas and whipped cream. Also known as the Cheesecake that feeds an army. Or a crowd of 20-some. Place a mesh strainer over a mixing bowl, preferably a bowl with a spout; set aside. In a saucepan, combine sugar, cornstarch, and salt; whisk until combined. While whisking, slowly add in 1/4 cup of the milk; continue to whisk until smooth. Whisk in the egg yolks and the rest of the milk. Place the saucepan over medium heat and cook, stirring frequently, until mixture begins to bubble, about 5 minutes. Reduce heat to medium-low and, using a rubber spatula, stir constantly, scraping the bottom and sides of the pan, until the pudding thickens and makes ribbons when drizzled over the surface; about 4 minutes. Remove from heat; stir in butter and vanilla extract. Continue to stir until the butter is melted and well incorporated. Pour the pudding through the previously prepared strainer. Transfer to a container and cover with plastic wrap, lightly pressing the plastic wrap over the pudding so to prevent skin from forming. Place in fridge and chill for 2 hours, or until set. In a mixing bowl, combine whipping cream, vanilla, and sugar. When chilled, beat the mixture until stiff peaks form. In a mixing bowl, combine ground crackers, sugar and melted butter; mix until well combined. Press mixture onto the bottom of a 13x9-inch glass dish. Place in the freezer for 10 minutes. In your mixer's bowl, combine Neufchatel Cheese, honey and vanilla; beat until blended and smooth. Remove crust from the freezer. Spread the cream cheese mixture over the crust. Arrange pineapple chunks over cream cheese mixture. Add half of the Vanilla Whipped Cream to the chilled pudding; fold until combined. Using an offset spatula, carefully spread the pudding over the pineapples. Spread the rest of the Vanilla Whipped Cream over the pudding. 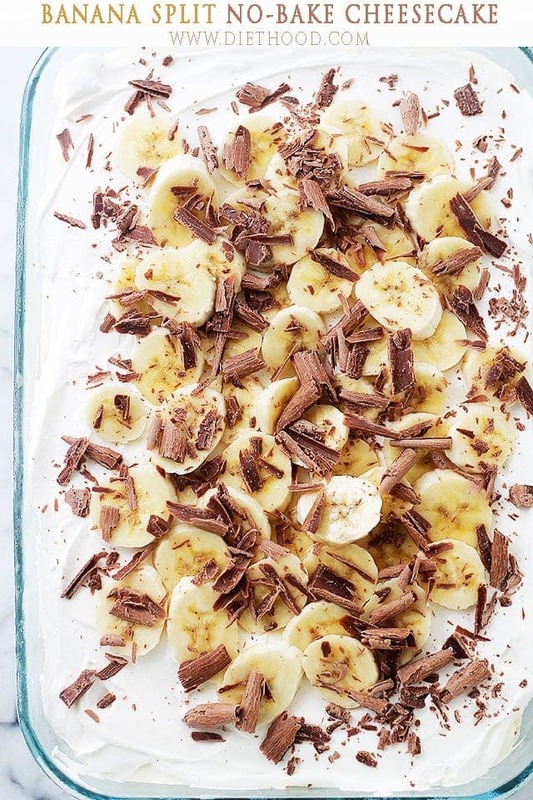 Arrange banana slices over dessert and top with chocolate shavings. the sunday byte | may twenty-fourth - kelly's ambitious kitchen. 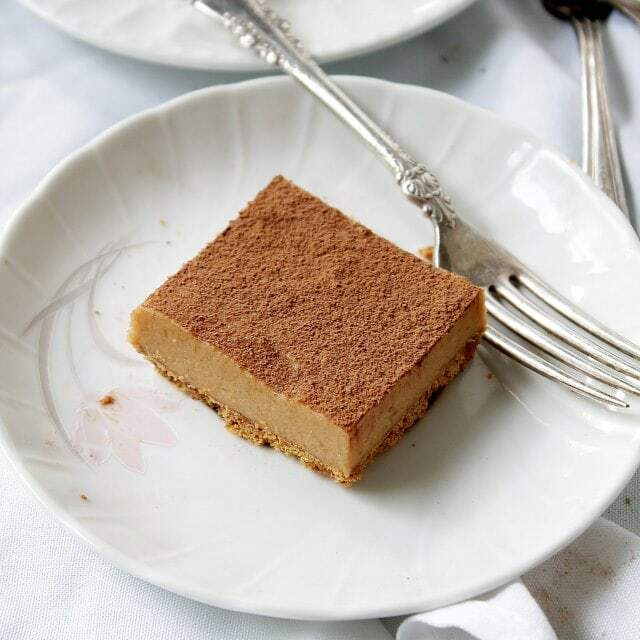 I made this yesterday and oh my gosh – it’s dangerously delicious! I just want to eat it all but I’m pacing myself haha and sharing! Thank you for your amazing and easy to understand recipes because I am a beginner! I love your site! I have never thought that Labor Day celebrates work by taking the day off. Now I can’t stop thinking about that! This cheesecake looks amazing. Even better is that you made everything from scratch. You even used fresh pineapple. This is my kind of treat! OMG, I would eat half of that right now. It looks beyond delicious! The pictures speak for themselves! No bake + cheesecake + feeds an army = happiness! Pinned! I would be hard pressed to share this dessert even though it is massive. I could eat three slices of this! So delicious! I definitely had more than three!! 😀 Thanks, Lori!! I want to frame that first pic, this looks and sounds incredible!! This looks amazing & your photo’s really capture it. I’m drooling right now, haha. Thanks, Leslie!!! Yes, drools are what we want, right!? haha 🙂 Have a great Labor Day!! I would kill for a slice of that this morning! It looks too good! Those chocolate shavings look amazing! Where did you find them? Oooo! 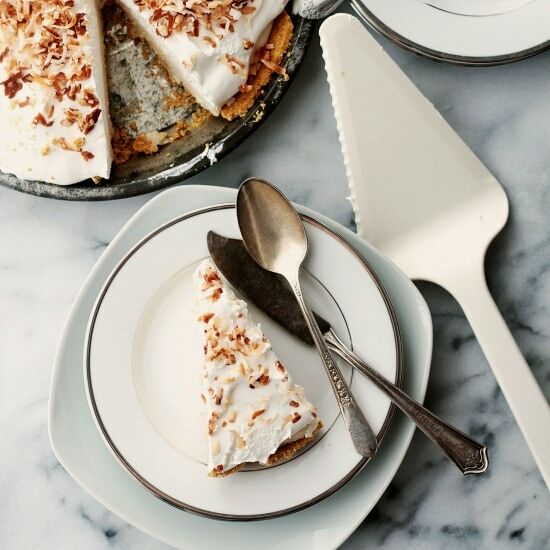 I want to dive right into this cheesecake! Fabulous! 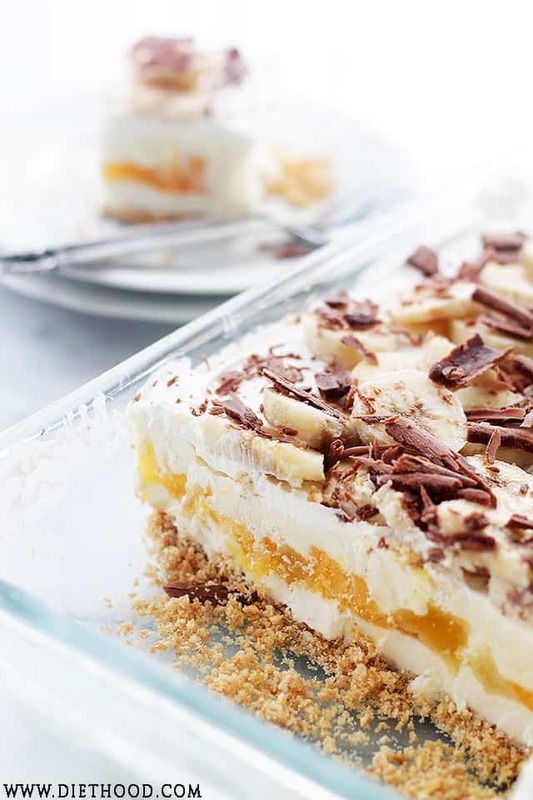 The fact that this is so easy and no bake is really dangerous…because I am debating whipping it up right now. All for myself. Gorgeous photos girl..as always! Pinned!